Proclaim yourself with our excellent Men's Custom Suits in Washington, DC. Michael Thomas Custom Clothiers keeps you dressed to impress with men's custom suits in Washington, DC. At Michael Thomas Custom Clothiers, we understand that appearance can make the first impression. Our custom made suits are tailored expressly to your measurements, adding sophistication and presence that off-the-rack apparel lacks. With our custom fitted suits, we can add a bit of breadth to your shoulders or camouflage a stocky build. Let our mens custom tailored suits be your mark of elegance as you conduct your business. We can also fit you for custom mens shirts and slacks. Beyond custom mens suits, we carry quality shoes, exquisite accessories, and provide mens alterations to give your year-old suit a flattering fit. Whether you've spent years in the beltway or you're new to the Capitol, you can add a bit of panache to your wardrobe with our mens custom suits in Washington, DC. 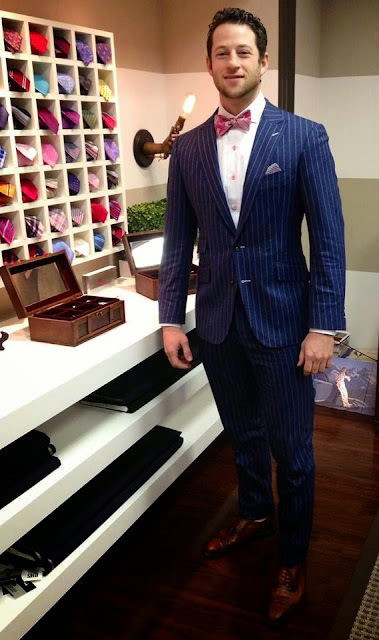 Call (202) 525-3391 to set up a fitting with our mens tailor. We opened our Men's Custom Suits in 1979. We are located at 1300 I St NW, 103, Washington, DC. See more Michael Thomas Custom Clothiers photos.